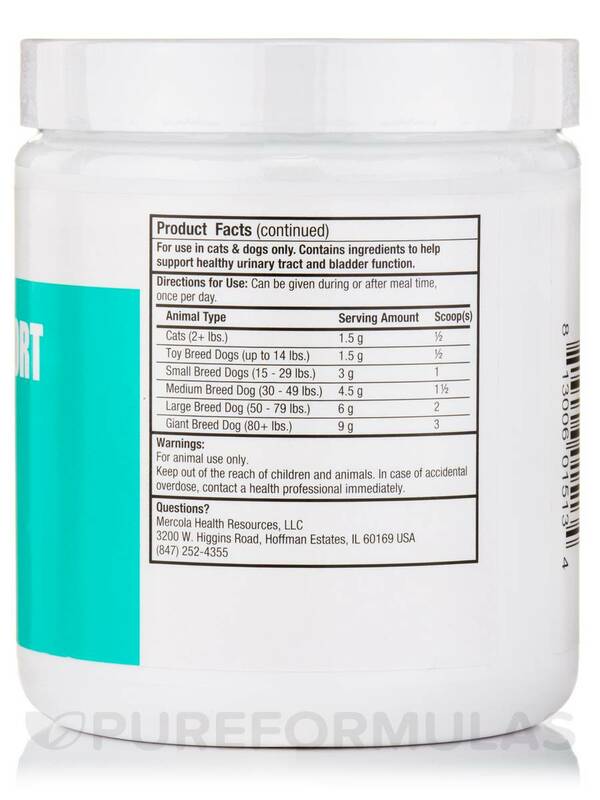 Promotes Optimal Urinary Tract Health and Function! 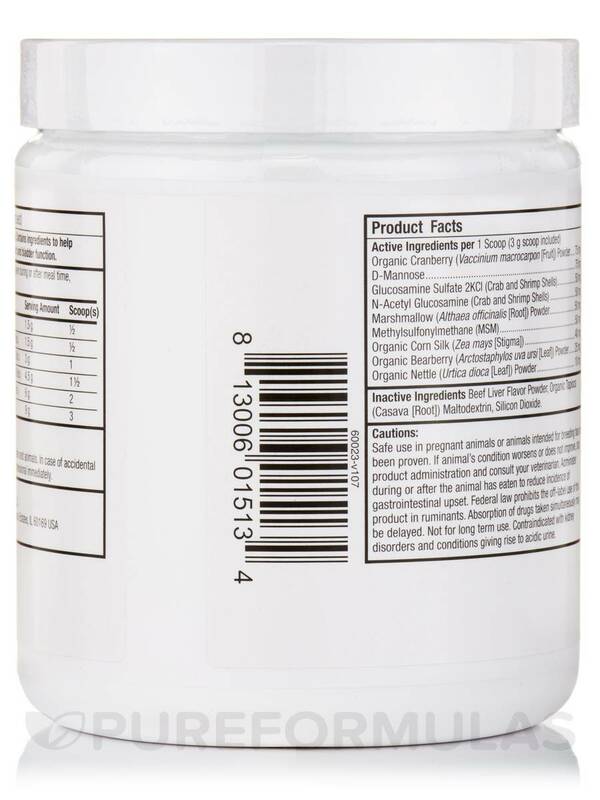 Inactive Ingredients: Beef liver flavor powder‚ organic tapioca (casava [root]) maltodextrin‚ silicon dioxide. Can be given during or after meal time‚ once per day. 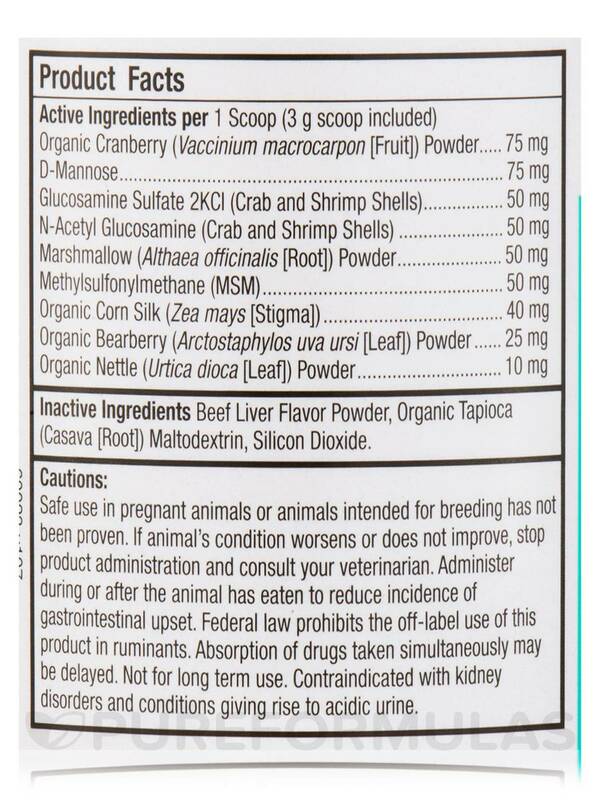 Dosage Tip: Administer during or after the animal has eaten to reduce incidence of gastrointestinal upset. Absorption of drugs taken simultaneously may be delayed. Contraindicated with kidney disorders and conditions giving rise to acidic urine. 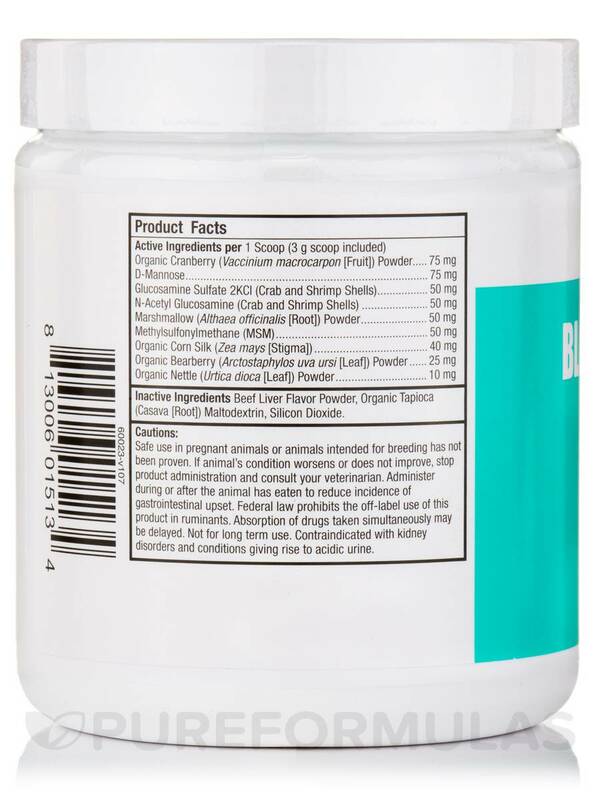 Start using Bladder Support for Cats & Dogs by Dr. Mercola on a dog with precious stone issues. We’ve implemented for all four dogs now. Works well to stave off infections. I took my dog off of a science diet c/d food to feed a higher quality grain free food . She was gaining weight and her hair was so greasy on it. 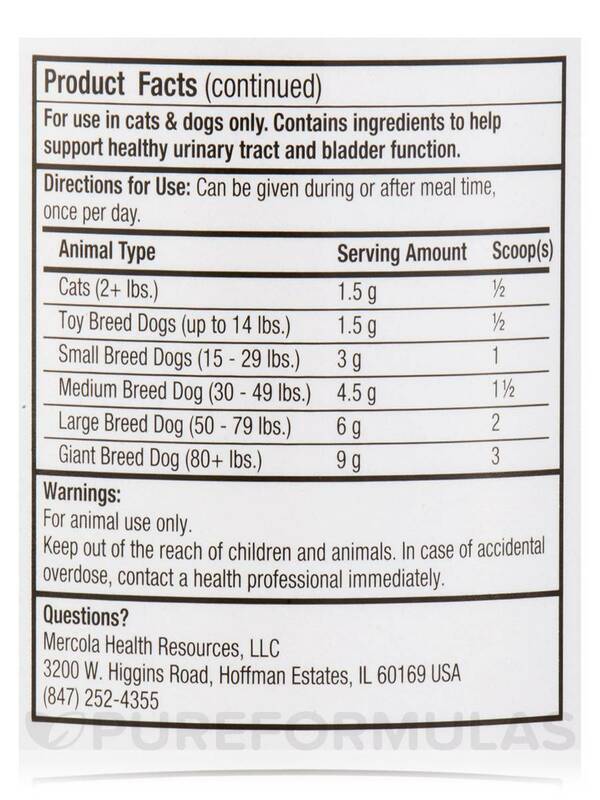 I read up on alternatives and found this Bladder Support for Cats & Dogs by Dr. Mercola highly recommended. She has been on this for several months now and so much healthier looking! Lost weight and coat clean and glossy. We go back for bladder x-rays soon and I'll update as to the status of her bladder ( stones forming or not) . So far so good! She loves the flavor. Great value for the money. 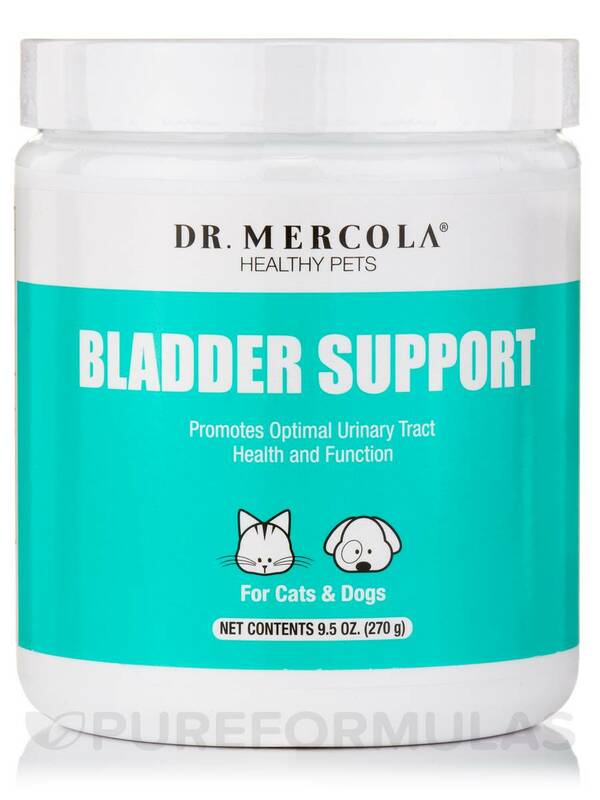 I bought Bladder Support for Cats & Dogs by Dr. Mercola because it is awesome and 2 of my 5 feline friends were having the typical bladder issue symptoms(going outside the litter box, going often, not much output). I mixed a scoop into each 5.5 oz can of 4health (grain and garbage-free) food and the next day, they were all using the box again. They did not act like they noticed it in their food. Now, all the kitties get some every day. to keep bladder issues at bay. Ordering again! Ordering here because the price is right. Cats don't mind it, mixes well in food, it works!